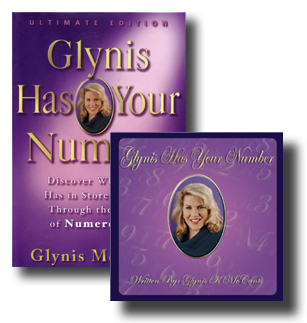 The Kit consists of the latest Edition of Glynis Has Your Number with the CD . We have found that those who have the Book and CD seem to be better incorporating Numerology into their everyday life. Order one Soulmate Breakdown or Individual Reading for only $10.00 (regular price is $18.95) when you purchase the Numerology Kit! Just order either one by putting it in your cart along with this Kit and your total will be adjusted at checkout.